I am leveling my staff, it is currently 200. How high can i skillup on these? I'm guessing the ones in the Woodlands are level 62-65 range. As 66 PLD almost all of them were DC, and to a 60 THF I was with they were all T-VT. They hit me pretty hard for DC, 40-60 normal, and Sickle Slash got up to 300. So make sure to buff if you farm them. The ones in Bhaflau are lower level but they LINK. The ones in Wajaom DO NOT LINK, but they are slightly higher level. Drop rate seems to be better off the ones in Bhaflau but it could have been only due to coincedence. These things Do link as i have caught links several times. Linking range is very small but they do link none the less. VT to me as DRK59. Needless to say, I didn't mess around with them except to confirm that they are non-aggro. Unknown to me if they link or not (I would think almost assuredly they do). Flee on my THF sub wasn't up, so I didn't chance it. 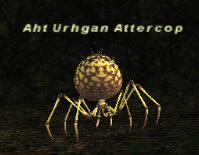 These things also drop Spider Webs with a pretty good drop rate even with an alliance. Was 2/3 on them.